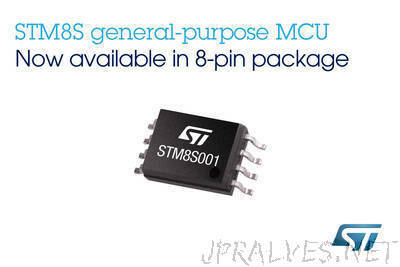 Unlike most rivals, the STM8S001 has I2C, UART, and SPI interfaces, giving unusually versatile connectivity options. With a generous 8KB Flash memory, 1KB RAM, 128-byte EEPROM, and 3-channel 10-bit ADC also on-chip, it delivers key features of ST’s most popular STM8S003 MCU in a space-saving, low-pin-count device. Additional features include five GPIOs, one 8-bit and two 16-bit timers, and an internal RC oscillator that allows flexible clock control from 128kHz to 16MHz. There is also a Single-Wire Interface Module (SWIM) for programming and debugging. Fully specified from -40°C to125°C and featuring the modern and efficient STM8 core operating at 16MHz, the STM8S001 is ideal for industrial devices like smart sensors and lighting controls, as well as consumer products such as toys, small appliances, personal electronics, PC peripherals, battery chargers, and many others.